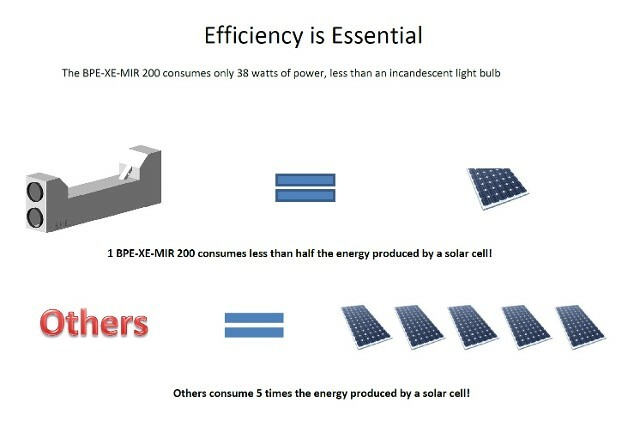 WHAT THEY DO: Building Performance Equipment, Inc.’s ERVs are able to precondition fresh outdoor air to room temperature for your building, school, office, or home while substantially reducing your energy bill, improving indoor air quality, and reducing the emissions that feed global warming. In other words, the units efficiently recover energy from stale air leaving the building and use it to warm room temperature in colder months and cool it during the warmer months. Please review our products below and consider a BPE ERV for your next new construction or retrofit ventilation project. These galvanized steel units are specifically sized to handle residential, small offices and dedicated ventilation applications. While the rest of BPE’s ERVs utilize separate in-line fans, the 200-i has two built-in fans, as well as plug-in capability via a power cord with a three-pronged plug. The 200-i is the perfect size for providing fresh make-up air to a small office (up to 10 people) or the home of a family of up to six. Simple to install, the unit can connect to new or existing ductwork, is light enough for DIY positioning, and easily plugs into a 120 VAC outlet. These galvanized steel units are specifically sized to handle residential, small offices and dedicated ventilation applications. Simplified residential Installation manuals are a good point of reference for installing the nominal 400 and 500 series BPE units. Typically, you would install these units with two fans that provide 50% to 75% of nominal cfm in airflow. 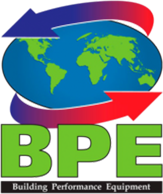 At this 50% to 75% flow range, the BPE units typically operate at 80% to more than 90% thermal efficiency. Since the 400 Series is slimmer than the 500, it will fit behind a drop ceiling nicely. The 500 Series is slightly larger and meets the needs of light commercial applications and classrooms of 25-30 students in an “On Demand” ventilation scenario. These galvanized steel units are specifically sized to handle commercial and industrial dedicated ventilation applications. They can serve a larger gathering room up to 75 people and can be sized with variable speed fans to address any ventilation need up to 1,000 cfm. The fans are installed in line with the ductwork. We can supply built-up systems, with fans, louvers, intake air hoods and filter modules as needed for the application. The efficiency, depending on air flow, can be adjusted from 70% to 95% thermal efficiencies. These galvanized steel units are specifically sized to handle commercial and industrial dedicated ventilation applications. They can serve a high school gym, providing ventilation for up to 150 people and can be sized with variable speed fans to address any ventilation need up to 2,000 cfm. Standard modules can be assembled and stacked for any need from 2000 cfm to 10 modules or 20,000 cfm. The fans are installed in line with the ductwork. We can supply built-up systems, with fans, louvers, intake air hoods and filter modules as needed for the application. The efficiency, depending on air flow, can be adjusted from 70% to 95% thermal efficiencies. 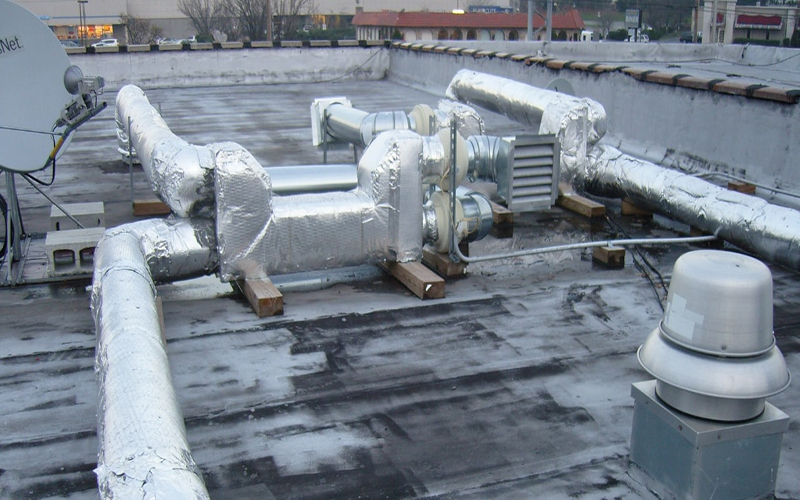 These galvanized steel units are specifically sized to handle commercial and industrial dedicated ventilation applications. They can serve a high school gym and can be sized with variable speed fans to address any ventilation need up to 3,000 cfm. Standard modules can be assembled and stacked for any need from 3000 cfm to 3 modules or 9,000 cfm. The fans are installed in line with the ductwork. We can supply built-up systems, with fans, louvers, intake air hoods and filter modules as needed for the application. The efficiency, depending on air flow, can be adjusted from 70% to 95% thermal efficiencies. These galvanized steel units are specifically sized to handle commercial and industrial dedicated ventilation applications. They can serve a high school gym and can be sized with variable speed fans to address any ventilation need up to 4,000 cfm. Standard modules can be assembled and stacked for form 2 modules or 4,000 cfm. The fans are installed in line with the ductwork. We can supply built-up systems, with fans, louvers, intake air hoods and filter modules as needed for the application. The efficiency, depending on air flow, can be adjusted from 70% to 95% thermal efficiencies. These galvanized steel units are specifically sized to handle commercial and industrial dedicated ventilation applications. They can serve a high school gym and can be sized with variable speed fans to address any ventilation need up to 8,000 cfm. Standard modules can be assembled and stacked to form 4 modules or 8,000 cfm. The fans are installed in line with the ductwork. 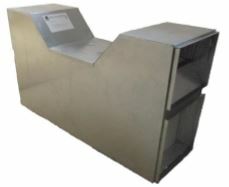 We can supply built-up systems, with fans, louvers, intake air hoods and filter modules as needed for the application. The efficiency, depending on air flow, can be adjusted from 70% to 95% thermal efficiencies. These galvanized steel units are specifically sized to handle commercial and industrial dedicated ventilation applications. They can serve a data center for free cooling or a larger industrial application and can be sized with variable speed fans to address any ventilation need up to 12,000 cfm. Standard modules can be assembled and stacked to form 6 modules or 12,000 cfm. The fans are installed in line with the ductwork. We can supply built-up systems, with fans, louvers, intake air hoods and filter modules as needed for the application. The efficiency, depending on air flow, can be adjusted from 70% to 95% thermal efficiencies. These galvanized steel units are specifically sized to handle commercial and industrial dedicated ventilation applications. They can serve a material processing or a larger industrial application and can be sized with variable speed fans to address any ventilation need up to 16,000 cfm. Standard modules can be assembled and stacked to form 8 modules or 16,000 cfm. The fans are installed in line with the ductwork. 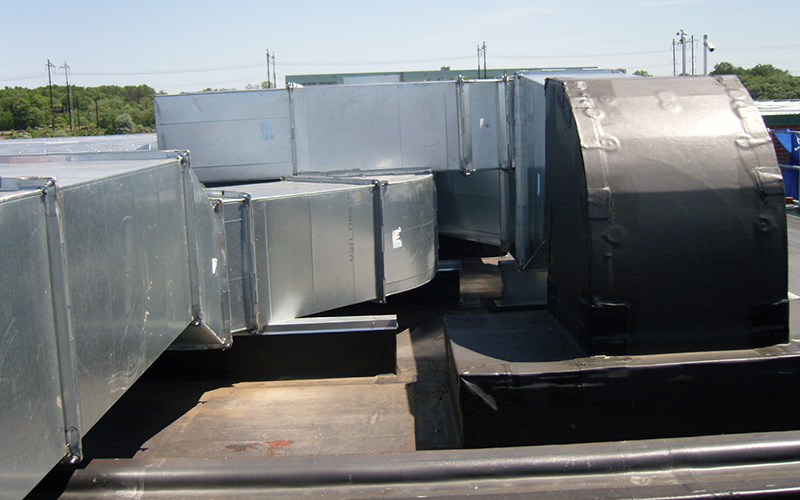 We can supply built-up systems, with fans, louvers, intake air hoods and filter modules as needed for the application. The efficiency, depending on air flow, can be adjusted from 70% to 95% thermal efficiencies.